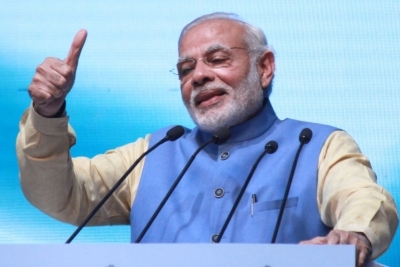 New Delhi July 12 (IANS) Questioning the government s decision to cut oil imports from Iran the Congress on Thursday called Prime Minister Narendra Modi a "paper tiger" and said he has buckled under the US pressure. The party said the Modi government has consciously reduced the import of crude oil from Iran in June and it proves that Modi s foreign policy is "confusing and circular". It also asked if the government has a concrete plan to protect the Indian customers from the rise of fuel prices due to reduction in oil imports from Iran. "India was importing 770 000 barrels per day that figure has fallen to approximately 570 000 barrels per day. Everybody knows India imports 80 per cent of its requirement of crude oil from overseas. "The reduction in import of oil from Iran will directly squeeze the pockets of the common man reduce supply increase fuel prices and bloat the current account deficit " said Congress spokesperson Jaiveer Shergill. The leader said the reduction shows that Modi is a "paper tiger" and has crumbled under the US pressure ultimately hurting the Indian consumer. "It also exhibits and proves that Modi s foreign policy is confusing and circular. Modi has once again prioritized the US interests over India s national interests when it comes to controlling fuel prices."